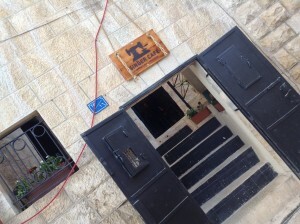 Singer Café is located across the Latin Church, very close to the Beit Sahour Municipality. You can take a bus to Bethlehem from the Arab bus station at Damascus Gate. Bus 231 takes you directly to the center of Bethlehem. You won’t be stopped on a checkpoint. Wait until the final stop at Bab Ezkak junction on Hebron Road. When you get off the bus you can take a taxi to Singer Cafe (don’t pay more than 30 shekels!) in Beit Sahour (10 minutes ride) or walk through the old city towards the Church of Nativity. Continue down to Beit Sahour and go straight over the roundabout at Ararat Hotel. When you see the Latin Church on your left and the Municipality of Beit Sahour on your right you take a right into a small street (Old City Street’ and you will find the Singer Cafe after 50 meters on your right hand side. It is behind a black iron door with stairs leading up to the entrance. Bus 234 takes you to the main checkpoint to Bethlehem, you get off the bus, follow the other passengers through the checkpoint (no need to show your passport here usually) On the other side of the wall you will find taxis. Agree on the price first and don’t pay more than 30 shekels. The taxi ride is 10 / 15 minutes. Coming from Jerusalem by car you take Hebron Road towards Bethlehem. Follow signs to the left towards Herodion. At the junction with traffic lights in front of Har Homa settlement you take left and now you keep going straight all the time. You will cross a checkpoint. After two roundabouts after this checkpoint, on the ‘bridge’ you take the first left towards Beit Sahour. (Ignore big red sign that says it is dangerous to your life! )At T junction go left, under the bridge, continue all the time straight through Beit Sahour. Go straight on the first roundabout (Bank of Palestine on your left, Suq al Shaab supermarket on right) Now the road goes uphill and you reach to a second roundabout. Here you take 3rd exit (left) into a small shopping street. When you see the Latin Church on your left and the Municipality of Beit Sahour on your right you take a right into a small street (‘Old City Street’ and you will find the Singer Cafe after 30 meters on your right hand side. It is behind a black iron door with stairs leading up to the entrance. From direction Bethlehem you come down to Beit Sahour. At the first roundabout (with Hotel Ararat on your left) you go straight into a shopping street. When you see the Latin Church on your left and the Municipality of Beit Sahour on your right you take a right into a small street (Old City Street’ and you will find the Singer Cafe after 30 meters on your right hand side. It is behind a black iron door with stairs leading up to the entrance. From the crossing in front of Suq al Shab supermarket in Beit Sahour you go up the street towards the old city. At the T-junction (police station on your right) you go right and walk up the (steep) hill until you see the Municipality on your left side and the Latin church on your right side. Go left into the small street (Old City street) and you will find us after 30 meters on your right hand side. It is behind a black iron door with stairs leading up to the entrance. Singer Café © 2014. All Rights Reserved.